We are seeking an upbeat and motivated Assistant Store/Grocery Manager in our Wabasha location. This position requires management experience and knowledge of OSHA Safety and Sanitation policies. Must be knowledgeable on inventory, ordering, interviewing, and hiring processes. Other responsibilities include team communication, task delegation, event coordination, merchandising, and the ability to lift (50+ lbs). We offer competitive wages and benefits with this full time position. 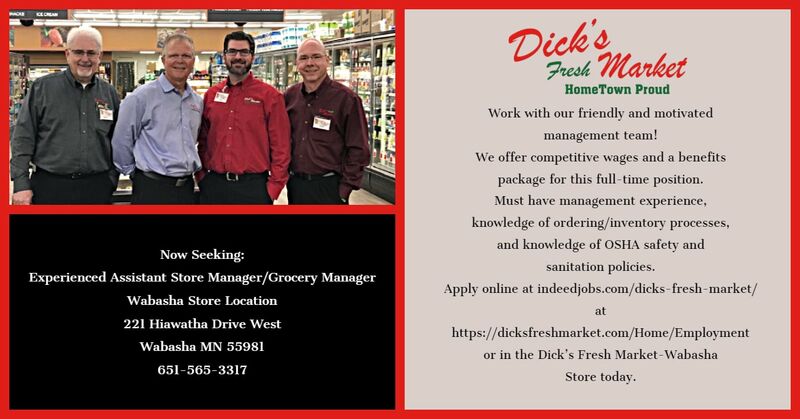 If you are ready to lead and develop an amazing team with our Wabasha Store Director, apply online or in store with your resume today.